Here's another artist link for my dear friend, Richard Miceli (Warped Sky Band member), see my early post "Rediscovering the Music Muse or Who's Jack" for more details). 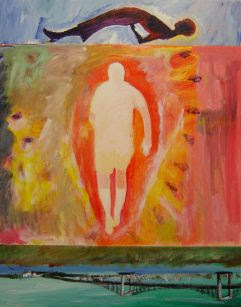 "It is the process of creation, not the end result of creation, that is the driving force of my work. By using whatever is necessary to resolve each work, without resorting to the refuge of historic logic and by controlling my own restrictions, I reach conclusions that are beyond the familiar. I create images with their own language and cadence. My work can be experienced and appreciated on its own terms, even though it may not be fully understood. I want to impress more than the eye - I want my work to probe emotion. By means of suggestion and implication, I can make the incomprehensible accessible and alluring." Take a moment, view his art, it will you something to think about. Enjoy. 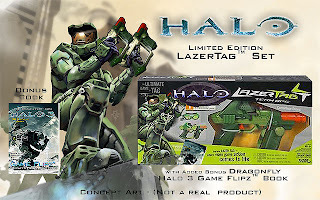 Halo Laser Tag Toy Deal Announced! 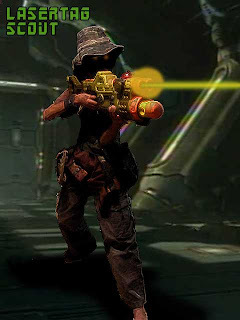 I still think the Hasbro LazerTag line are better designed, but I can only hope Bungie has a lot of input into the final toy design, and demand top quality. I don't assume I had any influence on this deal, whatsoever, but if they saw this blog before their announcement, I bet a account exec or two started sweating a little bit, wondering who leaked the info. My Dragonfly Halo Game Flipz™ book would still make good premium bonus for the Jasman toy release. It's available. I added new links to websites of some very talented people, who just happen to "family" and "friends". 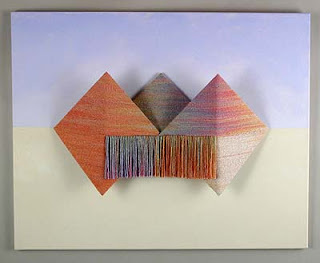 First, is Holly Sorensen, a textile artist (weaver). Holly produces wonderful pieces of art on a loom with originality and excellent craftsmanship (or is it Crafts"person"ship?). "Holly Sorensen's fascination with fiber began in her childhood, while playing in the old woolen mill her family operated in Connecticut. "The colorful webs of yarn, noisy clanking looms, and rich smell of lanolin were magic to me," she says." "Holly presently has her studio in Empire, Michigan, where she finds inspiration for her fiber art in the soft palette of the local landscape. Holly's work can be seen at the Belstone Gallery in Traverse City, Michigan." Holly is my wife's aunt, and one of the people I really admire as an artist and warm person. Check out her art at the link above. Next, are some friends I haven't seen in a while, but they are still very dear to us (Lisa and myself). Dev Ramsaran and Sonja Kodric Ramsaran are animation artists living in Canada. They recently sent us a email with the link to their studio website, a truly family affair, with their lovely daughter, Lief. "Dev Ramsaran graduated from Sheridan College's classical animation program in 1978. He won first prize for animation at the 1978 Canadian Student Film Festival with Sonja for the film 'Madhouse Rag'. Since then he has worked in the field on a multitude of productions for television, videos and feature films. He has worked as a storyboard artist, sheet director, animation director and overseas animation supervisor. He has been recognized by The National Academy of Television Arts & Sciences several times for contributing to the multiple Emmy Award winning 'Arthur' TV series. "Sonja Kodric Ramsaran graduated from Sheridan College's classical animation program in 1978. Her student film 'Madhouse Rag', produced with Dev, took first prize at the 1978 Canadian Student Film Festival...She has worked in the field as a traditional classical animator in Ottawa, Toronto, Montreal, Athens and Zagreb." 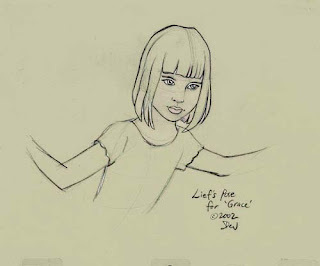 "Lief Renata Ramsaran is an inspiration to the creative process at New Lief Films Inc. 'Grace in the Woods' was a story developed by Lief and her dad during bedtime storytelling...Lief designed the company's logo with a leaf for a nose. She also designed and painted the website's 'Welcome' page using Adobe Photoshop. I just found this flying radio controled dragonfly on the Wow Wee toy site. I'll have to get one of these as a mascot. On the Gametrailer.com forum I started a thread calling for Nerf and LaserTag video game tie-ins. Some people just didn't get it, so here's a dummy mockup. As they say, "a picture is worth a thousand words". My kids recently got Nerf dart Blaster that I just have to get for myself. This thing is so cool (Check out the picture above). It looks like a prop from the "Aliens" movie. If you were a kid of fifties like me you had "toy guns" and played "War" and "cowboys and indians", long before it was un-PC to do so. Being a sci-fi fan, I like rayguns, blasters and laser pistols from Buck Rogers to Star Wars and beyond. Just a quick cruise about the toy sections Toys R' Us or Target and you'll be amazed at the amount of well designed "Blasters"in the toy market now, ("Blasters is our small attempt at parental Political Correctness in our home). So here's are some of our (my boys, and mine, my wife will have nothing to do this stuff) current arsenal. The Nerf Longshot CS6. This thing is massive, about 32 inches long. That a lot of plastic for $30.00. It comes apart to become two blasters. Being the nerd that I am I start to think of ways do to "improve" it. You know, modify it! Well, a quick look on the web reveals there is a whole army of nerds doing that already. NERF NERDS UNITE!! I can't wait to add my planned "mods" to the fray. 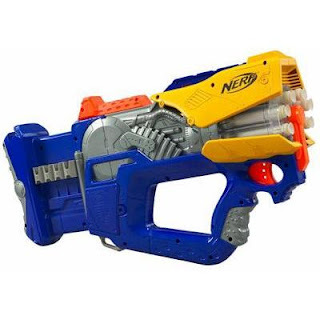 One of my favorites is the Nerf Maverick REV-6 (below), it reminded me of Hellboy pistol in the comics and movies. And it was cheap, under $10.00. My other favorite is the Nerf Firefly. 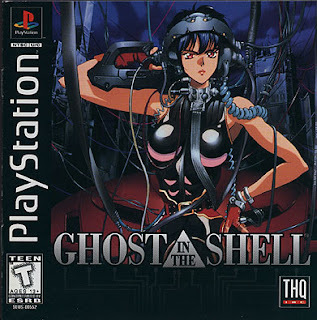 It flashes when it fire and makes the foam darts glow in the night and the design is like something from the Ghost in the Shell anime movies and series. My boys also have the cool Hasbro LazerTag sets. Actually, I got the big rifle with missile launcher first and they pick up the pistols the next day (paid for out of their own allowance, I might add). It's really fun when their friends bring their LazerTag sets over and the safe firefight begin. Best of all there is no agruments about who's "out" or not because the units keeps score. It's fun having kids and being able to sample their playthings. Okay...I was buying stuff like this for myself before they were born. If you work into animation or comics, you know most of the toy collectors are middle age guys with deep pockets. Another thing is when you see any "behind the scenes" feature about an animated film or video game company profile there are always some bunch of toys on the artists work area and most likely a Nerf firefight will break out. So, follow nerds, united and have fun. I just posted a movie of my Dragonfly Flipz™ Afro Samurai Anime Flipz book on Gametrailers.com (click on the link to view, the file was too big for Youtube). I really pushed the limits on his one: 200 pages from a video clip that was 4 1/2 minutes. That's about as far as I'll try to go for this small size book 3 1/2" x 5". It gets a little bulky for flipping. Check it out and leave a comment here or on the Gametrailers' comment section.